Healthy, radiant skin is just a few strokes away. Top your skincare regime with a soothing face massage. The right skin products and adequate UV protection promise a silky, perfect look. But, a relaxing face massage improves overall facial texture. Face massagers can enhance blood circulation in the face area for a firmer, more radiant skin while allowing skincare products to absorb better. 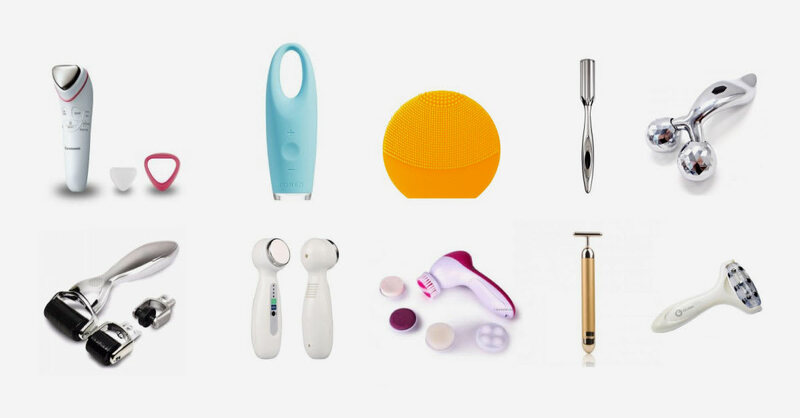 Restore youthful skin and gain a healthy fresh look with these face massagers we’ve found for you. This Panasonic Ionic Cleansing-and-Toning Device is perfect for getting the satin-soft and toned skin you’ve always wanted. The device comes with ionic power that delivers Vitamin C into the skin while its massaging feature helps the skin absorb moisturising ingredients, providing a face lifting effect. Plus, the massager works well for facial cleansing and absorbs impurities efficiently. Having dark eye circles? Why not give this eye massager a try? This Foreo Iris Eye Massager comes with an Alternating T-Sonic™ technology that helps to keep the areas around the eyes bacteria free and promotes absorption of eye serum and cream. Its gentle massaging touch lessens the appearance of eye puffiness and dark circles, for a naturally youthful look. The LUNA™ Play Plus combines face massaging and cleansing with its soft silicone touch-points that deliver T-Sonic™ pulsations. The pulsing massage is an effective anti-aging treatment that helps to restore firmness to the skin. The device also has longer silicon bristles for intensified cleansing that clears residue, dead skin cell, and excess sebum. Highly recommended for acne-prone skin. This face massager from ReFa uses micro-current technology, with a double Quatro roller that comes with Swarovski Crystals. The massager works by tapping gentle stimulation into the skin to enhance the production of natural collagen. This helps to improve skin firmness and give a face lifting effect. Having fine microneedles in a derma roller can boost the production of natural collagen and elastin thus, reducing fine lines, wrinkles, and scars. This 3-in-1 derma roller comes with three roller options of different needle count. Gently roll microneedles on the affected area to regenerate skin. Slim face, defined facial features and depuffed eye bags? If these sound nearly unattainable to you, then a jade roller is your answer. Well known for their healing properties, jade crystals are especially cooling and helpful to boost blood circulation across your face to lift and firm skin. They also effectively drain fluid, keeping you from looking swelled up. Since the early times, the Japanese have been using gold for various skin treatments. This Japanese technology 24K Gold T Bar massages the face into a V shape with just a few strokes. The vibration function efficiently activates skin cell which helps in slowing down ageing and firming the face. It is also small and handy too, so you can carry them around easily. This face massager uses ultrasonic waves to penetrate deep into the layers of the skin to enhance renewal and restoration of the skin cell. This advanced technological device also helps in toning facial muscles and improve blood circulation, leaving skin healthy and radiant. This 5-in-1 product combines the function of face massaging and cleansing, featuring five varieties of massage and cleansing heads. The device effectively multitasks thanks to its roller feature. This affordable massager is battery powered which makes it handy and portable, suitable for travel. A 3D roller massager works best in activating the skin cell to rejuvenate the skin and slows down ageing. The roller massager also enhances lymphatic drainage, a process of eliminating waste products for healthier skin. This ultimately results in glowing, luminous skin. This skin treatment device uses infrared ray which enhances the production of collagen and helps in restoring skin elasticity. The massage function features a load-stone massage with nine anti-bacterial nickel massage beads, both beneficial in improving blood circulation. Revitalize your skin with this therapeutic device to obtain natural firmness and a youthful look.